You may have noticed the numerous recycling bins around the school. If you were here last year, you may also remember attending presentations about the importance of recycling and sustaining the environment. These are two examples of BHSEC’s attempt to involve students in helping the environment. Ms. Powell, the sustainability coordinator, shares that BHSEC, as a New York City public high school, is “mandated to participate in recycling efforts” in order to make the city sustainable. 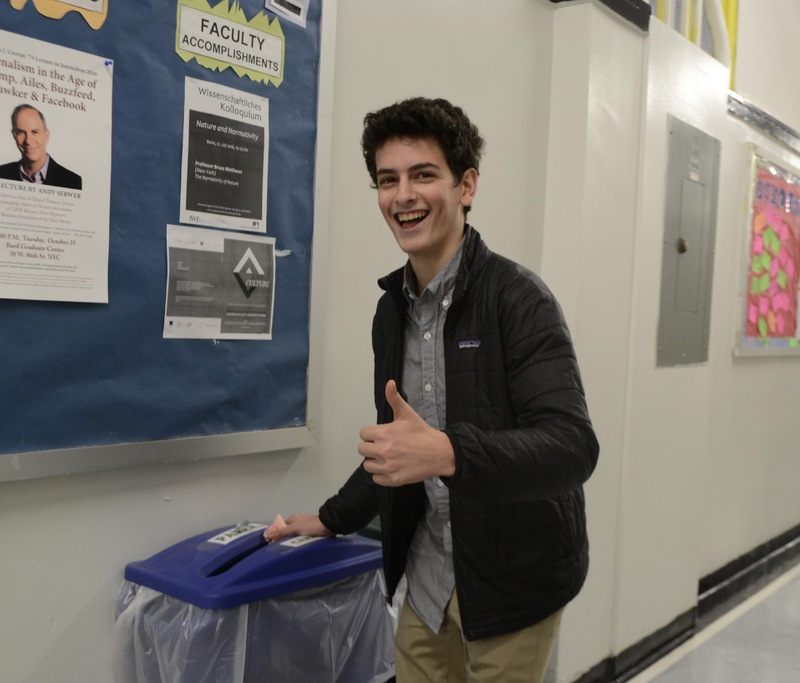 BHSEC went beyond the mandatory recycling efforts, and over the past years, the school has taken several actions in order to protect the environment. In the last two years, BHSEC became part of the Green Schools Alliance, which helped facilitate the school’s efforts by allowing BHSEC to bring sustainability experts, such as Laura Piraino, who worked with the sanitation department of GrowNYC’s sustainability division, to the school. Piraino gave a presentation to students about the reasons behind recycling, and instructed them on how to recycle properly. In the past, the Eco Club led a clothing drive in order to recycle clothes and shoes to keep them from being put in landfills, which would damage the environment. According to Ms. Powell, the most important change that has happened in BHSEC and in all public schools as a whole in the last two years has been the insertion of the organic bin. The organic bin collects food waste separately from other waste, which allows it to be composted, preventing it from being placed in landfills. Putting food waste in landfills is very damaging to the environment, as it leads to the formation of methane gas, which is a prime factor of global warming. So what is really happening to the environment? As many of us know, the environment is currently in very poor conditions. According to 350.org, this is mostly due to the increase of carbon dioxide in the atmosphere, which is caused by our increasing burning of “coal, gas, and oil to produce energy and goods.” This increase of carbon dioxide in the atmosphere will eventually result in climate change aggravating beyond our control. The increase of carbon dioxide in the environment leads to global warming, which causes glaciers to melt, therefore reducing sources of clean water. Global warming is also causing mosquitoes, and the diseases that they carry with them, to spread, along with droughts. Ocean levels are beginning to rise, which may lead to the future submersion of highly populated lands. In addition, the increasing carbon dioxide in the atmosphere is being absorbed by the ocean, which is causing the oceans to be acidic, therefore making “it harder for animals like corals and clams to build their shells and exoskeletons.” Extreme weather is also manifesting itself in different parts of the world, which poses a threat to the security of certain zones. The drastic changes occurring in the Arctic show that climate change is happening more quickly than many scientists believe, which makes the issue even more urgent. The ECO Club and the Student Union are working very hard to make sure that during this year BHSEC is able to make even more changes to sustain the environment. The main goal for this year is to educate others about sustainability and to take action in order to change the poor conditions of the environment. Firstly, Eco Club and Student Union will place recycling centers in all of the classrooms in the building, meaning every room will have three different bins to dispose of waste. Holly Hutchinson, Y2, one of Eco Club’s co-leaders, comments on the new recycling centers at BHSEC, “My hope is that since all of the classrooms will have properly labeled uniform green, blue and black bins, that recycling correctly will become instinctive for BHSEC students.” Secondly, beginning from after the holidays, there will be Student Union and Eco Club members, as well as faculty, staff, and student volunteers in the cafeteria who will assist students in placing their waste in the appropriate bins. There will also be a Dean’s Hour presentation regarding the sustainability project that will help educate students on how to make a difference. Unfortunately, Ms. Powell states that plans for BHSEC’s yard could not be made due to construction, which cut off the yard’s water system. Ms. Powell adds that hopefully, once construction is finished, the BHSEC community will collaborate to fix the damage in the yard and start growing plants again. Ms. Powell notes that the involvement of students in the sustainability movement “fluctuates” over the years. Ms. Powell, Student Union, and Eco Club all hope that students’ engagement will grow this year. Kamran Jillani Y2, another Eco Club co-leader, adds, “Everyone’s cooperation is important and will ensure that BHSEC continues to engage in eco friendly habits for years to come.” Ms. Powell explains that there are different ways for students to get involved in the sustainability movement. According to Ms. Powell, following one’s “personal responsibility” is an important part of taking action in sustainability. There are different ways to follow one’s personal responsibilities; the main one is to recycle. Ms. Powell comes from a household that “didn’t waste anything,” which means that recycling to her is “second nature.” She understands that it might not be as natural for some people, however, she points out that it is simple and only takes a few seconds. One’s personal responsibility is also to become more aware of the quantity of energy that one consumes, how one consumes it, and being concerned with consumerism. In other words, one must be aware of what one buys, and how much of it one buys. Controlling consumerism is important because the transportation of commercial products contributes to global warming. This sentiment was shared with the BHSEC community when Dr. Dickson Despommier gave multiple presentations over the last few years about urban vertical farming, in which he presented his research on the innovations of people growing their own food. Ms. Powell informs us that, “at BHSEC we grew herbs and salad ingredients in the yard to serve in the cafeteria, to cut down on our carbon footprint, and have the experience of growing our own food.” Following one’s personal responsibilities is very important because not only does it allow a person to help the environment, but it also helps influence others to do the right thing. Ms. Powell adds that there are also political ways to be engaged in the sustainability movement. An example of this engagement is “our students’ current involvement in the protests against the Dakota Access Pipeline in North Dakota. The Dakota Access Pipeline is being built to carry low-grade ‘tar sands’ oil to refineries to the south for global export. Its construction has the potential to cause great environmental damage via leaks into the area’s freshwater systems. The construction also violates government treaties with the Sioux tribes.” According to Ms. Powell, the construction of the Dakota Access Pipeline would be “an environmental disaster and a political disaster.” She adds that “BHSEC students, led by Lily Gordon and Julia Dowling, are educating others about the issue, encouraging them to call government officials and the pipeline’s investors to protest the construction. Recently the Army Corp of Engineers, responding to public protest, temporarily stopped the construction to review its environmental impacts and alternate routes.” People who want to become more engaged with these movements can also volunteer with Eco Club and Student Union to help at events. The school as a whole can be more engaged in the sustainability movement by taking part of citywide and regional organizations, and joining environmental youth leaderships. Radwana Rinta Y2, a member of Eco Club, shares that “A lot of us are unaware of how we as students can contribute to the protection of our environment.” Everyone can do something to change the environment, from recycling to becoming engaged in political activities. It does not matter how people get involved; it only matters that they do because anyone can make a difference. Previous Mandatory Dean’s Hour Received with Confliction, Ambivalence.